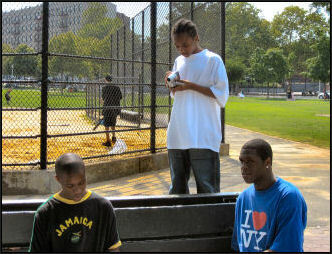 In the summer of 2007, the New York Civil Liberties Union partnered with youth from three community organizations – Future of Tomorrow, Make the Road New York and Youth on the Move – to produce three short documentaries on student experiences with the over-policing of New York City schools and the School to Prison Pipeline. The NYCLU supported the youth in creating their own videos using their own words and footage. The documentaries feature over a dozen youth discussing the School to Prison Pipeline as well as school safety agents, police officers, metal detectors, the over-reliance on suspensions, over-emphasis on discipline, and criminalization of students. The films are accompanied by a School to Prison Pipeline Toolkit that includes information on the issues and ways to take action.